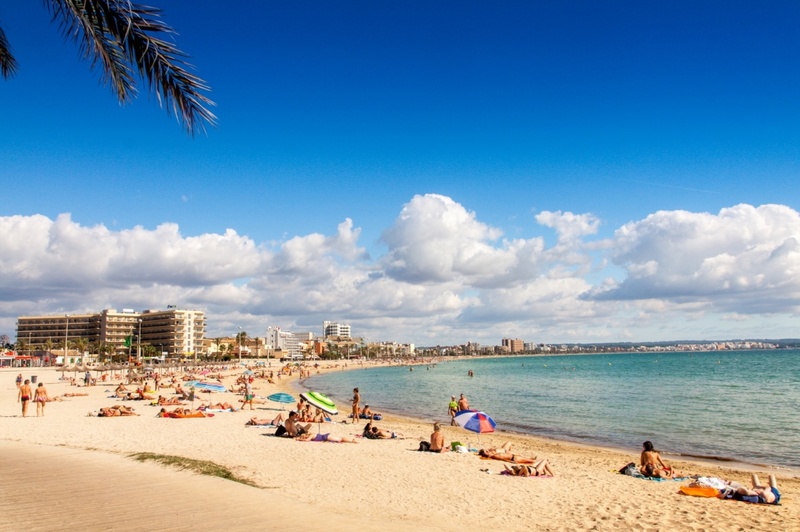 Playa de Palma, translated as 'Beach of Palma', is one of the most popular and touristic spots in Majorca. It is located near the centre of the island's Southern coast and boasts a shoreline that is around 5km long, beginning at the Ca'n Pastilla resort and ending at the El Arenal resort. Especially convenient here are the numbered huts situated along the beach, known as 'Balnearios'. Each Balneario is equipped with a shower, a toilet and a food-and-beverage stand. There are more than a dozen Balnearios on Playa de Palma. When visitors are not swimming or sunbathing, they are able to stroll along the wide beachside promenade lined with charming cafés, bars, boutique shops and nightclubs. Bicycle rental is also available for those who would prefer to explore the promenade this way. Either way, be forewarned: if you see people selling watches on the street, do not buy anything from them, as their merchandise is likely to be fake or defective. Getting to and around Playa de Palma is simple. It's located less than 4km from Son Sant Joan International Airport, or 'Palma Airport' as it is also known. There is a public bus that can take you directly from the Airport to Playa de Palma. Moreover, public transportation options in the area are plentiful. There is the popular Mini Train, which runs the length of the beachside promenade, and many buses are in operation as well. However, note that these buses do not often run according to precise schedules. Find information about selected Hotels, apartments and rooms in Playa de Palma to choose the perfect place for your accommodation.